It started in 1907, when President Teddy Roosevelt decided to have American coins redesigned to better represent the nation. World-renowned sculptor Augustus Saint-Gaudens created the new Indian Head Gold Double Eagle and Eagle with a classic Miss Liberty on the obverse, wearing a non traditional Indian bonnet. It is still considered by many experts to be one of the finest examples of symbolicart ever presented on a coin. In 1908, Bela Lyon-Pratt continued the line of Indian Head Eagles with his unique Half and Quarter Eagle gold coins featuring a unique "incused" design. Unfortunately, most of these treasured gold coins were melted down during the Great Depression. The few remaining specimens are among the most sought after gold coins in collecting today. This exclusive setfeatures three solid gold coins from the golden age of American coinage. 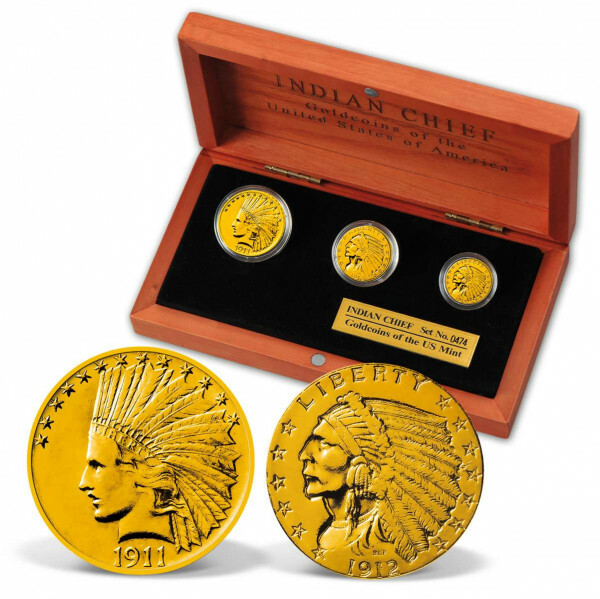 Each set contains: one Saint-Gaudens Gold Indian Head Eagle, one Pratt Gold Indian Head Half Eagle, and one Pratt Gold Indian Head Quarter Eagle! These solid gold American coins are guaranteed to be at least 82 years old.